Hear about how this outdoor kitchen was constructed using cinder blocks, cast concrete countertops and a faux stone veneer. Not all outdoor kitchens are built the same way. 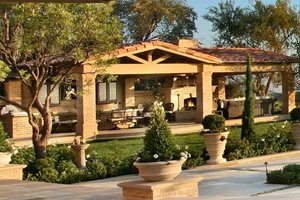 There are a variety of options when it comes to how the structure, or base, of an outdoor kitchen will be built. The materials selected for an outdoor kitchen must be able to withstand high temperatures as well as a variety of weather conditions. Framing options include concrete block, brick, wood or steel. 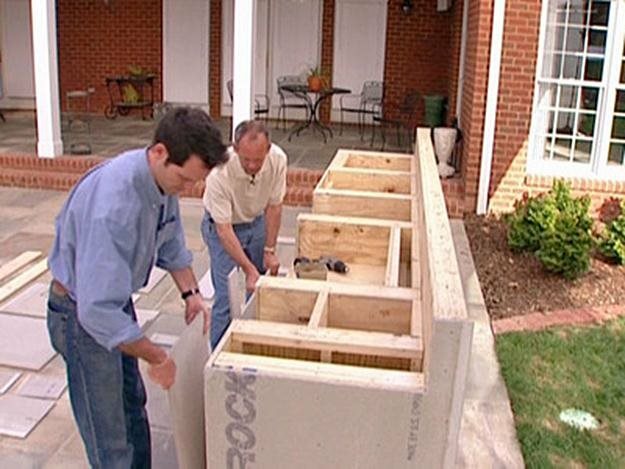 The construction of an outdoor kitchen can be a complex process. For safety and durability, it is essential that construction be carried out properly. Hire a masonry or landscaping contractor that has experience building outdoor kitchens. Prefabricated outdoor kitchen kits can be purchased if you wish to avoid detailed construction. While each outdoor kitchen is unique, the construction process is relatively uniform whether it's built out of wood or block or even a framework kit. However, there are many hidden factors that come into the creation of an expansive satellite outdoor kitchen that can have a big impact on how long it takes to build and whether or not there are specialties that demand a variation in the process. Forno Bravo in Marina, CA. 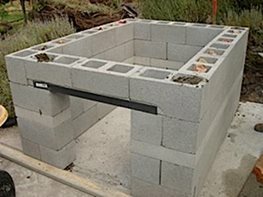 A common option is to build your outdoor kitchen out of concrete block. A concrete block structure must be built on a solid, level slab of concrete. 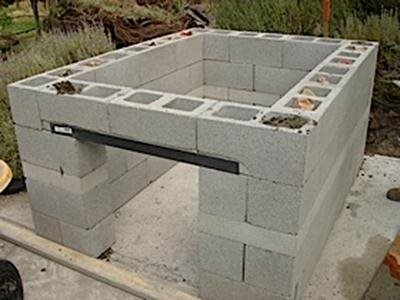 Concrete block is affordable, weather and fire resistant, and easy to work with. Decorative concrete panels, stucco, tile, and stone are all suitable facing materials for an outdoor kitchen constructed with concrete block. Concrete block construction allows for complete customization. You will be able to configure your kitchen any way you like and include as few, or as many, appliances and accessories as you wish. 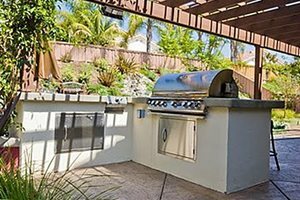 Building an outdoor kitchen out of concrete block requires masonry skills, so hire an experienced contractor to do the job. Buddy Segura Masonry in Fallon, NV. Another option is to build the base of your outdoor kitchen with brick. Brick kitchens will need to be constructed on a concrete slab. 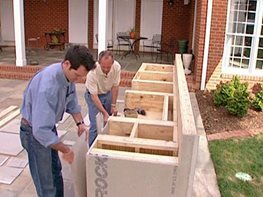 Constructing an outdoor kitchen with brick can be complicated and time consuming. However, the end result will be structurally sound and will hold up to the elements. An added benefit is that you will not need to face a kitchen built from bricks, it will already have a beautiful finish. 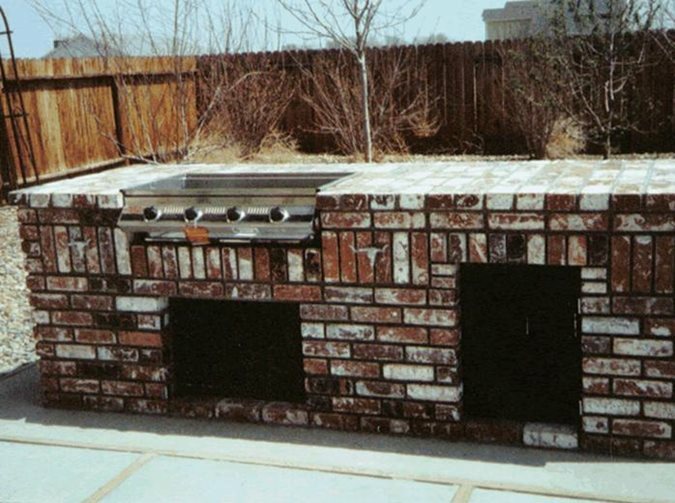 An outdoor kitchen constructed of brick is completely customizable. When using brick, you will be able to layout your kitchen any way you like and include as few, or as many, appliances and accessories as you wish. 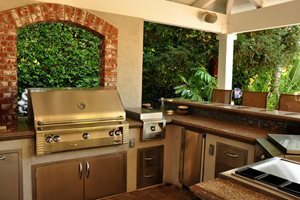 Building an outdoor kitchen out of brick requires high-level masonry skills, so if you don't have considerable experience building with bricks and mortar, you should hire a contractor who does. You can build your outdoor kitchen with wood. If choosing to build a wood-framed base you should use pressure-treated pine because it will hold up better under the extreme heat omitted by the grill and will be less likely to rot. In order to protect the wood frame from heat and water, it should be covered with cement backer board, both on the inside and outside of the structure. Be aware that there is still some concern over fire safety, even with the backer board in place. Once the backer board is attached to the frame, it can be faced with decorative concrete panels, stucco, stone, tile, or a brick veneer. Just like concrete block and brick, wood-frame construction gives you complete customization options. You can make your kitchen any size or shape and include whatever appliances you'd like. Fresco Frames in Morgan Hill, CA. 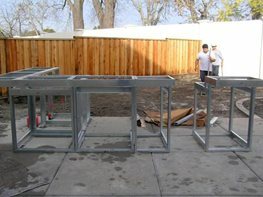 A popular option for outdoor kitchen construction is a steel frame. Steel-frames are heat and weather resistant and very sturdy. You can purchase steel frame kits designed specifically for outdoor kitchens. The frames come in a variety of configurations and can support a range of appliances and accessories. Steel frame kits can be used to create both simple and elaborate outdoor kitchens, plus everything in between. The frames are positioned as you like, riveted together and bolted to a concrete slab. Cement backer board is used to skin the structure and then the walls can be stuccoed, stone-clad or tiled. 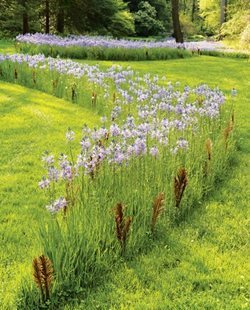 Grading a landscape to drain is step one of the construction process that may prove the most important. 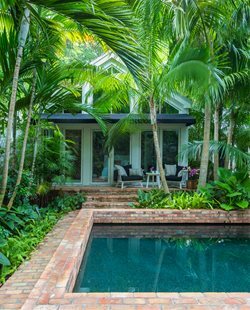 Soil compaction, leveling and layout of drainage structures such as drop inlets may be considered in these finish elevations with sometimes must meet those of preexisting patios, pool decks or other elements. Installation of utilities is the most challenging of all outdoor kitchen construction features because they may require specialty subcontractors for electric and plumbing needed by many of the kitchen features such as a sink, which requires hot water and a sewer drain. 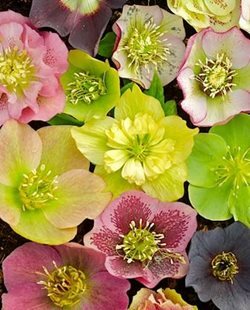 All utilities must be hooked up to the breaker box of the home itself and run underground to the points of connection at the kitchen. The size of the trenches, depth, the need for conduit and other factors must be met exactly for building code inspections. If there's a shade arbor or a roofed portico to protect the kitchen and its components, significant footings must be installed early on. Many outdoor kitchen systems that offer prefabricated units are installed upon existing paving. Other built from scratch units may be installed on their own concrete footings then paving is laid around them. The installation of the kitchen units whether a single island or a three sided series will vary in time depending on how elaborate the design. Those which require stone veneer and elaborate detailing as well as complex components can extend construction time considerably, particularly when subcontractors must return to perform final hook ups for inspections. This stage of the process may require granite countertops or tile or even Corian. The more elaborate these finishes are the most time is needed to complete the work. Granite is installed in a day while ceramic tile may take singificantly longer due to the many steps of the tilesetting process. One of the final steps is the installation of lighting fixtures and overhead fans. This is not time consuming, but the lighting must be fine tuned to illuminate particular parts of the kitchen or adjacent dining areas. The positioning of bullet spots and other specialty light fixtures is important for ensuring all the work places are usable after dark.